With the proliferation of video iPods, everyone is wondering, what’s the easiest way for me to get my videos on to it. There are numerous commercial products out there that will gladly take your hard earned money, and probably not give you a quality product in return. Now here is a great program and ask nothing of you in return, “Any Video Converter”. This is definately the easiest video conversion app I have ever used. What I love about freeware and opensource developers is that they code for the love of coding and try to scratch and itch that they have. And we reap the benefits when these people scratch. So go donate some money to your favorite freeware and opensource projects, don’t you think they deserve it? Did you get a Wii? I got my wii, and love it… The motion controller is all it’s cracked up to be and much more. I love this thing and i’m not a big gamer. I will write a post later about my Wii experience. I have to get back to Wii sports. I have a mild addiction and there may need to be an intervention. Will what I do today pay off for me 90 days from now for me? So my wife today told me she didn’t like my wordpress design/template. What are your thoughts. Should I pick another, or go with a completely original design? All constructive thoughts, comments and criticisms will be taken into account. Please no flames. One of my favorite sites, Copyblogger, joins Darren Rowse’s blogging network, b5 Media. Copyblogger blogger gives you tried and true tips for copywriting tips geered towards blogs and marketing. This is by far some of the best content on the web if you are looking at blogging for a living, he does not use any shady tactics, just quality headlines and quality content. If you haven’t seen it yet, get over there and start reading. I guarantee you will be adding the copyblogger feed to your RSS reader in no time. I was sitting here thinking about what I use on a daily basis that allows me to get my work done. I’m constantly trying out new tools to see if I can incorporate them into my daily life to try and streamline my work flow. Some of these tools workout, but most just get forgotten about never to be thought of again. Dual-Screens Web Browser on one screen, productivity app on another. i Know I’m missing some stuff but these are probably the most prevalent. What do you use on a daily basis for your work flow. I’m sitting here in New Buffalo Michigan, sitting by a fire and drinking some wine while my wife and friends are playing Pictionary. I would be playing if it was a different game, but I hate Pictionary, I don’t know why, I just do. 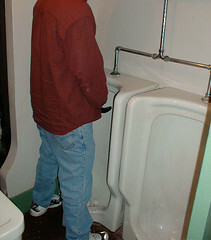 I will have to upload a pic of the world’s largest urinal, these things are hilarious. I really don’t know if they are the world’s largest, but they are ginormous. Tomorrow we’ll be hitting some wineries and eating lots. Hopefully make it to the jerkey store and buy some of the best jerkey I have ever had. Most of you think really dry tough meat when you think jerky. This stuff is like eating a cured steak, thick and meaty and does not have the texture of a leather shoe. Hope everyone has as fun of a Veteran’s Day weekend that I will have. Take time to think about the troops in Iraq and Afghanistan even though you may not agree with the war. What do you get out of your blog? Brian Clark of Copyblogger writes “Why people want to know what’s in it for *you*”. So what do I get out of this website? Why do I write a blog? It’s definately not ad revenue. What I get out of my blog is hard to explain. When someone shoots me an e-mail or comments on my blog it just feels good that someone out there cares about what I write. I have also met some really cool people cause of the Internet and this blog. If I meet someone I can just tell them to go read some of my blog and they can learn about what i’m about and my interests. The 30+ RSS subscribers and the 300 unique visitors I get daily tells me that there are some people out there that read my site. When I think about it, what I get out of this site is I am creating “networking” possibilities through my readers that I normally would not have had without starting a blog. Go check out my Del.icio.us links for something to do. For some reason I get crazy anxiety on election days and a couple days after. The whole recount thing doesn’t help it at all. Do other people take the election that seriously? or am I just crazy and nuts all rolled into one?